I think this week was the most difficult for me. The brief being “use buttons to highlight your look”. I just wasn’t sure where to go with that. But when I think buttons, I think classic collared shirt. So that’s where I went. Even now, still unsure about my choices, I can’t see anything else. As you can see, though, my shirt doesn’t have a collar. I suspected E wouldn’t like one. She hates anything that closes close to the neck. She says it chokes. I asked her about making her a shirt like her dad’s and she said she didn’t mind the hard bits at the sleeves (cuffs) but that she didn’t want the hard bit at the neck (collar). So off the collar went. I also knew that anything I wanted her to wear had to be supremely comfortable. This is a child who lives in knits. I have a store bought shirt that has a woven front and knit back as well as knit panels on the underside of the sleeve. It’s the most comfortable shirt I’ve ever worn. I decided to copy the concept for E’s shirt. 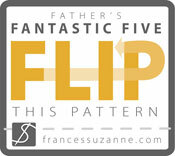 The pattern is based on the Oliver + S Building Block Dress. I used the bodice and sleeve pieces and modified them. I decided to make it long enough so that it could be tied in a knot at the front. E picked out the fabric at Mood. She fell in love with the subtle pattern on the white cotton-nylon knit and chose this geometric print on lightweight cotton. I used some cotton-spandex jersey I already had for the underside of the sleeves. A fun side effect of the slightly stretchy sleeves et that they’re easier to roll up, aren’t constricting when rolled up, and they stay put. I call that a win! Interestingly, the pants are the first thing I knew I was making. I was thinking of ways to add functional buttons to a legging and thought of buttoning up the side of the leg. I ordered some rayon ponte for them. I wanted something a little thicker and sturdier than plain old jersey. When the fabric arrived, the hand was different than what I thought it would be. More like what I imagine scuba knit is like. We’re talking fabric that refuses to crease. I swear, I pressed so hard and nothing. I decided to switch to something with more structure: Jalie Éléonore pull on jeans. They have all this great jean styling and topstitching and the straight leg is just the right width. I modified the pattern to have buttons at the outside leg seam below the knee. It’s perfect for this time of year, when mornings are cool but afternoons are hot. Every single seam is topstitched. Like I said, this fabric is impossible to press. I wasn’t going to get neat, flat seams without topstitching. The buttons on the pants were chosen to match the colors of the shirt. 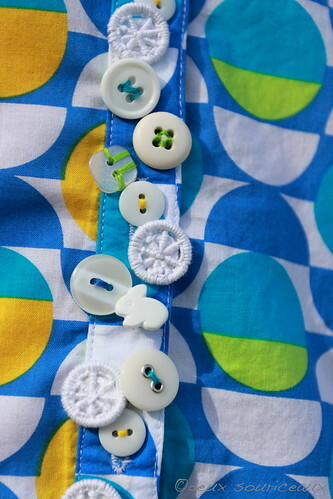 I also bought thread to match the shirt and used a contrast color for each button. Yeah, it’s subtle, I know. For the shirt, I went with white buttons. I remembered I’d seen a tutorial to make dorset buttons. The tutorial has you make big 1.5″ buttons but I wanted smaller ones. I couldn’t find small enough plain rings and ended up with jump rings. That little slit in the jump ring was a challenge when wrapping the thread but it worked out. I made two small ones for the cuffs and 6 bigger ones for the front. When came time to sew the buttons on, it felt like something was missing. It just wasn’t special enough. Then, I remembered a cardigan I’d bought from Anthropologie. It closed with big sew on snaps and the band was decorated with big overlapping buttons. Now, this was not a classic shirt (almost) and I just couldn’t use snaps to close it. I picked some plainer white buttons from my stash to close the blouse. All sewn on with either white or yellow thread. Then, I added my decorative buttons. The dorset buttons and a variety of white buttons I had. (Finally, the stash comes in handy!) I even managed to convince E to let me add a bunny button! I love what I did with the buttons in this outfit even if it doesn’t pop out at you right away. 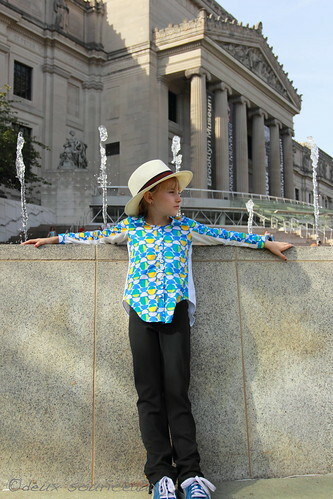 PS: We took pictures at the Brooklyn Museum. I was hoping to get closer to the columns but they aren’t accessible. The fountain there is very cool. There’s this drum music playing, not too loudly, and, if you pay attention, you’ll see that the fountain follows the beat of the drums! Merci! Emmanuelle est effectivement en pleine forme! So good! I think the pants are my favourite. Love the buttons up the side. I update once in awhile…. Love your outfit! 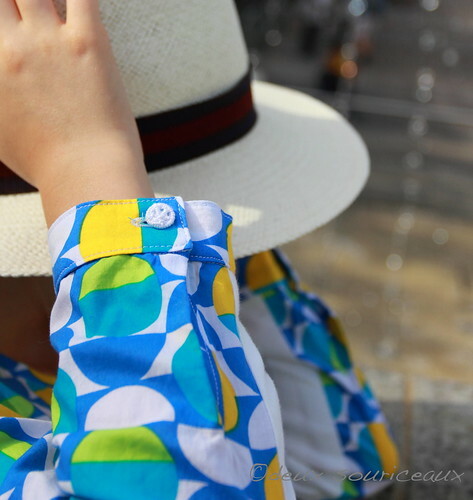 I love all the decorative buttons on the shirt. The whole outfit looks really comfortable too! Thank you! Emmanuelle has been wearing the pants a lot so I’m going to take that as a confirmation that they’re comfortable. I checked out that pull-on jean pattern, and plan to add it to my collection. I love the innovative way you closed the bottom of the pants. An outfit to be proud of for sure! I’m sorry that you are the first competitor to leave Project Run and Play. I really liked your completed project and all the creative details. I was looking forward to seeing your next look! 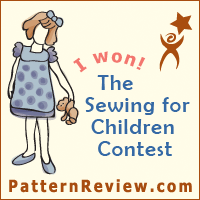 Be sure to share it in the sew along link. I’m sorry too. I really really wanted to continue! 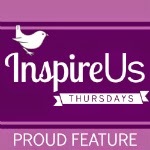 I’ve already taken the pictures for week 2 so I will definitely share it in the sew along. I’m so proud of it! This is such a cool design! 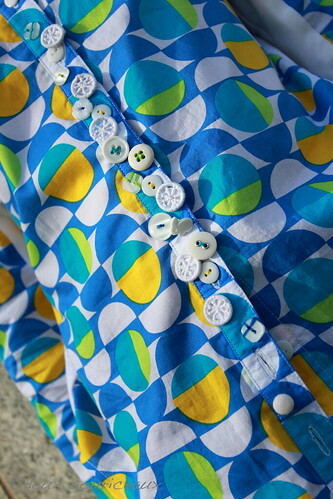 I love the spacing of the buttons on the pants, and I LOVE that you made your own dorset buttons! Thank you! I just had to make special buttons.